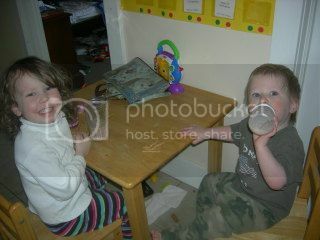 Oh boy are my two youngest high energy and high maintenance kids! They definitely keep things hoppin’ in the Bailey homeschool! 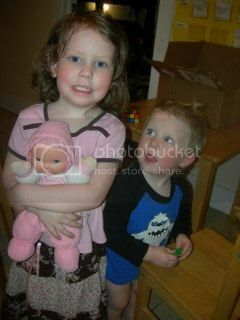 I get asked a lot how in the world I can homeschool at all with a 3 year old and a 20 month old running around. In some seasons it’s been very hard. Newborn seasons are always tough and to be honest, the kids get a bit more life lessons than book lessons in those first few months with a new baby. We do our best but baby’s needs come first. Around 10 we all sit down together at the big dining room table and do “together school”. We pray, read history lessons, do an art study, etc. I have nothing formal planned for the littles during this time period. They usually run around the upstairs playing. We have lots of manipulatives and we’ll usually dump something out to occupy them for a few minutes. Their favorites are Lauri puzzles, Lincoln Logs and Wedgits. 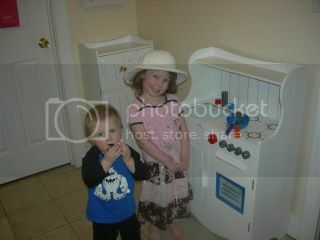 They also like to play in the toy kitchen area. We also just flat out have to be flexible. Sometimes we have school on the living room floor so the littles can feel like they have mommy, too, and crawl all over me while I’m reading. Sometimes Sophia wants her own “school” so we’ll give her a workbook and box of crayons at the table or we’ll give her an extra map drill to color. Sometimes we have to close the books, have lunch early and finish while Jesse is napping. I remember way back when I was a working woman. I specifically remember getting out of my car one morning and thinking, “Is this how it is? Every day of my life the same thing?” I can’t sugar coat it. Homeschooling with littles is challenging. But it is NEVER EVER boring and I love it! I love that you shared this! I miss chatting with you. Life around here is just as crazy! 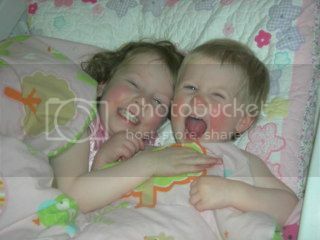 And my youngest two are definitely high energy, high maintenance. I just read this post to Helen and Rachel. We all enjoyed it very much! Jesse and Sophia have really grown. We all miss you all alot. @Amy: I miss chatting with you, too! I haven’t really connected with any moms here that have littles and older kids. Plus I need a convention partner!! The closest one is four hours away. @Donna Jo: Glad you and the girls enjoyed it. You know we miss you guys!